There are some beautiful safari destinations in the Eastern Cape of South Africa but sometimes the journey is long and calls for a detour! One of the major attractions in this area is the National Arts Festival. This festival takes place for 11 days during the month of July and is where the best musicians, dancers, stage actors, poets and artists all come together to showcase their work. The philosophy of the event is that there be no censorship and that all are welcome in the spirit of anti-apartheid activists in the cultural sector. 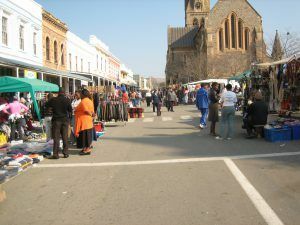 Rhodes University is settled in this little town so plenty of students bring fresh ideas and energy to the festivities. Join us on our little side track through to the sleepy town of Makhanda (previously Grahamstown) for an immersion in the arts. There is no Uber in Grahamstown and taxis are fairly expensive but you shouldn’t need to drive between shows. However, for when it starts to become darker in the evenings, we found out that there is a rather ingenious method of transport on offer – the tuk-tuk. This small scooter-like cab is ideal for crossing the short distances between the shows and your accommodation with only a minimal fee to pay. The shows and exhibitions are scattered throughout town but National Arts Festival programs and tickets are available from the National Monument, now in memory of Mandela, located near the entrance to town. 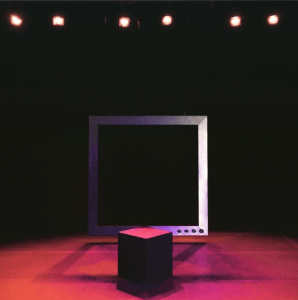 There are Main (curated and selected by an artistic committee) and Fringe events (a diverse assortment of works that doesn’t need to adhere to the selection process). You can book online or telephonically before you go but it’s also exciting to show up outside a venue that looks interesting (you can normally spy some pre-show rehearsals happening) and just get tickets then. Our experience included a steam punk band, a couple performing off-the-cuff, a dramatic interpretation of South African poet Ingrid Jonker’s artistic nature, a noir detective play that turned into a tango, a black and white video installation and a stand-up comedian performance. These do not even include all the shows that were on our wishlist (we were not there for the entirety of the festival) which included a rendition of Animal Farm and installations by revered South Africa artists of the apartheid protest era. There is so much to see and very little time! The beauty of this small and artistic town is that you can try something new every night, including the restaurants! While coffee was never in short supply at the venues themselves, we found a range of culinary styles in town as well as a little further out. While normally frequented by students (thankfully those not performing are on vacation) this bar is actually an integral part of the town’s heritage having served drinks of all kinds to many generations. Our friend introduced us to this treasure which lies just outside of the main town square. 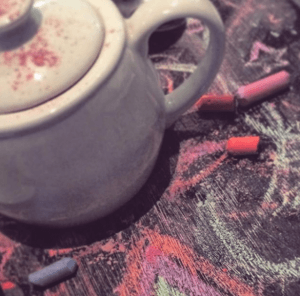 Every table is a chalk board and comes with a few pieces of chalk for your enjoyment. There are also a few vegetarian options available from their harvest table! We stopped here one morning for breakfast, captivated by the quaint little English-style storefront with a giant hat hanging as the sign. They serve traditional English meals and a provide a hearty breakfast before you start out on your day of shows. Walking up the stairs of an older building in the main square we discovered the Red Café, perfect for quiet evenings coloured by Van Gogh paintings. They serve a mixed batch of meals but once again we found it to be very accommodating in terms of vegan and vegetarian choices. There is also a deck from where you can view some stray mimes or witness stressed tourists running to make their seating time. We hope this advice is helpful and entices you to venture off the beaten path in South Africa. There are so many places, just slightly more remote than the usual destinations, that are well-worth the visit. 2 responses to "National Arts Festival Cultural Detour"
I went to school in Nelspruit. My two brothers and I were in the boarding school. It was a wonderful time of my life. We were the only English speaking children. My family were living in Johannesburg. I also went to school in Nelspruit! Thanks for sharing with us and reading our blog.